Copyright Gerard DuBois, Roaring Brook Press. A very long time ago—so, so long—I took a class from a Swiss mime, Jan Kessler. This was my senior year in college, when I decided to loosen the yoke of my heavily academic load with a couple of courses that had amazing reputations. (The other was a class in Persian art. Fabulous.) Sadly, I remember very little about either class, but both were gifts of different kinds, opening worlds. Of course I knew of the great Marcel Marceau, and the mime class only intensified my appreciation of his work. After Marceau died, my agent, Steven Chudney, asked if I had ever entertained the idea of writing about him. No. I knew very little about his life. It’s almost impossible to take a suggestion from another person about what to write. Ninety-nine percent of the time, those ideas belong to that person. But the thought wormed its way into my brain cells. I started looking stuff up and began learning surprising information M. Marceau. Example: I had no idea he was Jewish. Ah, research. A lot of writers love research. Why? Because it postpones the act of writing. So I amassed interviews, videos, books about mime and its history, necessary information about World War II (e.g. the evacuation of Strasbourg), programs from world tours, newspaper articles about his performances, and books by M. Marceau himself. I thought about him all the time. If I don’t have that passion, I can’t put words on paper. Finally, I wrote, and as the story took shape, I wondered—was I nuts? 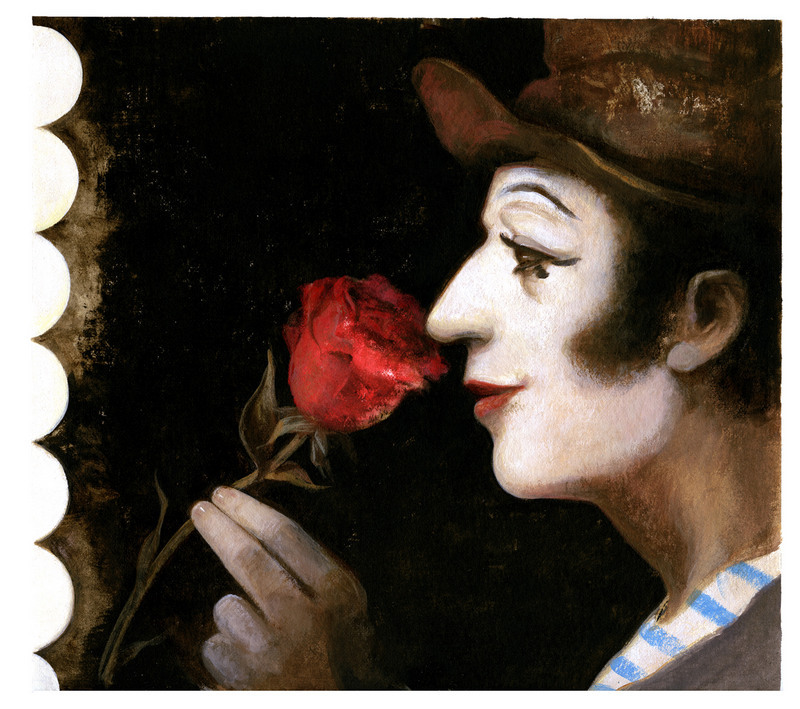 How would a picture book about this particular mime even be possible? There were no actual lions, no stairs, no other people on that stage. Just one very recognizable man in a spotlight. How could such imagination be represented on the page? Answer: if Neal Porter is your editor, he will find Gerard DuBois, and you will be extraordinarily lucky. Your jaw will drop in amazement when you see proofs. 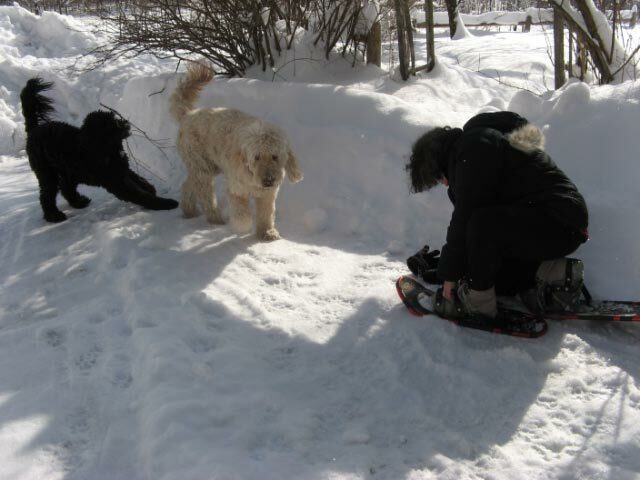 You will run around showing them to everyone you know—even your dogs. And now, almost four and a half years since Neal bought the manuscript, I am dancing about. Rob actually studied with Marceau, and I wanted to see what he would say. I was incredibly nervous. What if I had gotten everything wrong—not the facts, but the person himself? When Rob liked it, I was a happy bunny. And Rob also suggested some mime exercises that readers could do, now included in the afterword. The photo of M. Marceau at the end has particular resonance for me. But you’ll have to visit my website to find out why. 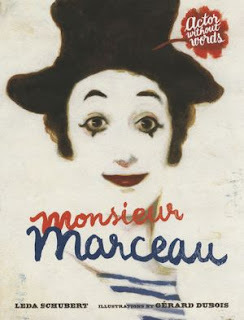 What a great artist Marceau was! I hope the book conveys a little of his magic, and I hope you like it. Leda! Always a delete to read about your work. I was going to leave this comment blank . . . Going to share the link now. Thank you, Cyn! And LinWash, I hope you didn't actually mean "delete." But you made me laugh. I actually meant "delight." Now I have to laugh! If I wasn't already excited to read Leda Schubert's latest and greatest creation--now I'm twice as excited!